Stradey Park Hotel01554 758171work HotelStradey Park Hotel is a four star hotel that has been lovingly converted from an Edwardian mansion and features sweeping panoramic views across Llanelli, Carmarthen Bay and the world famous Gower Peninsula. At the weekends this hotel is lively and bustling with plenty of people from all walks of life. We pride ourselves on taking special care of every one of our guests and our staff will be more than happy to help you with whatever requests you may have. For those of you that wish to avoid the bustle and have a nice quiet break we have our Rooftop Lounge, the perfect place to relax, with stunning views and a relaxing ambience; all guests are catered for. Why not sample the food in our exquisite Samphires Restaurant? We serve a variety of meals all with locally sourced ingredients wherever possible. Samphires Restaurant offers a traditional carvery on a Sunday, with beautiful views from the restaurant or the veranda outside. We have an exceptionally creative Executive Chef and our restaurant dining options reflect this. This impressive Edwardian mansion mixes traditional features with modern style. Many rooms are newly refurbished and all have flatscreen TV’s, telephones, hairdryers and tea/coffee making facilities. The hotel has free Wi-Fi and free parking. 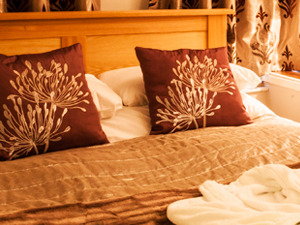 Stradey Park Hotel is close to many popular local attractions including Oakwood Park, the National Wetlands Centre, Ffos Las Racecourse, Machynys, Glyn Abbey & Ashburnham Golf Clubs, the National Botanic Garden of Wales, Pembrey Country Park and many beaches, including Cefn Sidan. The accessibility to the M4 means that you can easily travel East or West to reach many of South Wales' most popular attractions. Stradey Park Hotel is a four star hotel that has been lovingly converted from an Edwardian mansion and features sweeping panoramic views across Llanelli, Carmarthen Bay and the world famous Gower Peninsula. As well as offering a wide range of room types, we can also cater for a wide range of events –whether it be a gala dinner, charity fundraiser or a small celebratory drink, weddings or business conferences, let us realise your vision to deliver a memorable event in the perfect venue. Our events team has the benefit of years of experience and the most up to date knowledge of technology coupled with passion and enthusiasm. We will take pains with the smallest details to ensure an event that captures the imagination from start to finish.